!K7 are pleased to announce Forest Swords as the next curator of the ever essential DJ-Kicks series. 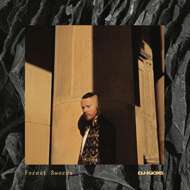 Following acclaimed albums on Ninja Tune and Tri Angle, soundtrack and installation work, and remixes of the likes of Bjork, Matthew Barnes aka Forest Swords has curated a 25-track compilation that draws a line between past inspirations and his current peers. "During all of the nights that shaped me as a music fan there wasn't really a focus on DJing etiquette; sticking to genres, perfect transitions – it was all pretty DIY and purely like having someone cook up their personal mixtape in front of you, to surprise you and to explore different sounds" says Barnes. "That kind of rough-around-the-edges approach is so much more exciting to me than something sterile and seamless and I wanted to carry that spirit into this compilation." Chosen over the course of a few weeks in winter 2018, the mixed version was cut on Barnes' laptop during a wintery cross-country train journey. Like much of his own output, his DJ-Kicks skirts around pristine electronics and embraces more organic textures: 80s post punk (Anna Domino, Dead Can Dance), classic 90s British electronica (Orbital, Mira Calix), and smokey digi-dub (Rhythm & Sound), all rub up alongside some of the most forward-facing producers working today (Demdike Stare, Laurel Halo, Fis). The compilation sifts through rhythms, shifting speeds and emotions: from pop icon Neneh Cherry's primal thudding to the zombified throb of exclusive Forest Swords track 'Crow' via Deena Abdelwaheed's clattering deconstructions to the euphoric two-step of Djrum. It's a collection of tracks that feels as restlessly curious and weighty as Barnes' own work.